I thought Duel! 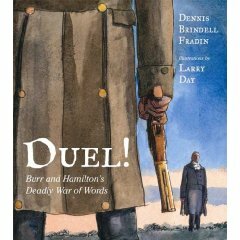 was an accessible nonfiction offering about the pistol match that killed Alexander Hamilton. Older elementary grades will appreciate it, and possibly even some middle schoolers. The illustrations are dramatic (I love that front cover, but at least one of my coworkers hates it), and the story of the feud between Aaron Burr and Alexander Hamilton is explained in interesting parallels and contrasts. Their childhoods are described side-by-side, as are their experiences in battle. I thought this would be great for Social Studies lessons and school history projects. There is a lot of text on the pages, but it isn’t boring or overwhelming. And kids will think the duel aspect is cool. Plus it’s a nugget of New Jersey history that doesn’t get much press in the classroom.